Greatest baseball playing U.S. President!! Slick fielding line drive swatting first baseman!! Sort of the Gus Suhr of his day, baby!! George Bush was the captain of Yale's championship college baseball team and he played in the 1947 College World Series. They eventually lost that game to the University of California on a home run from future Red Sox star Jackie Jensen. 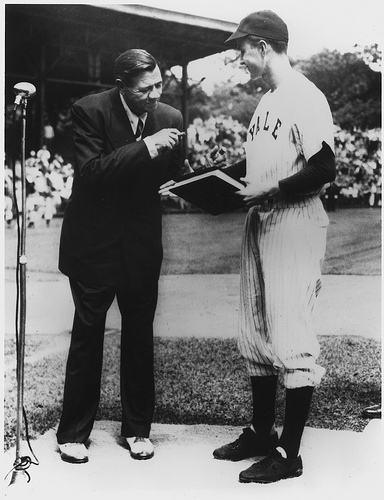 In 1948, Babe Ruth, in his last year of life, came to visit Yale. A photo was taken of Ruth, and the Yale team captain, Bush. During the College World Series in 1948, the batboy for the University of Southern California (Yale's opponent) team was Sparky Anderson. Wow!! I just knew that Grossbergian freshet would loosed with a baseball related nudge, baby! Bush seems top have been the most accomplished baseball player among US presidents, but another US President was an even better football player than Bush was a baseball player. In January 1935, the Green Bay Packers and Detroit Lions were jockeying for the professional services of a football player from the University of Michigan. The two-way player led the Wolverines to national titles in 1932 and 1933 and appeared in the Chicago Tribune College All-Star Football Game at Soldier Field on Jan. 1, 1935. His performance capped a legendary college football career and had NFL teams clamoring for his services. Instead of joining the young professional league, Gerald Ford rejected the offers of the Packers and Lions and opted for law school. Four decades before he would become the 40th President of the United States, Ford enrolled at Yale Law School, where he was an assistant boxing and football coach. His grandfather, Samuel Prescott Bush, had been an assistant coach for the Ohio State University football team in the 1890s. S.P. Bush learned football with the Stevens Institute of Technology team in Hoboken, NJ. We need to ask Roger who the best cricket playing Prime Minister was. I have no doubt the best curling PM had to be William GladSTONE, baby!